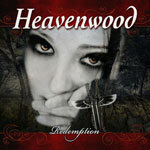 Hailing from Portugal, Heavenwood began as a death metal band in 1992. In the passing of sixteen years, the band has evolved into a more dark rock and metal band with influences from goth, doom and death metal (in the snarly vocals). Yet even this description is suspect for I didn't quite know what to make of Heavenwood. Frankly, I'm glad I don't base all my reviews on first impressions or I would have never made it through Heavenwood's latest work, 'Redemption.' With exception of a few songs and some great guitar solos, this work was droll and monotonous. I listened to it on my daily walk and could barely pay attention to what I was hearing. I'll admit that half way through my first listen I was ready to give up on Heavenwood's Redemption. The inherent redundancy was only redeemed by impressive fret work. Maybe this album will grow on me eventually (if I listen again). I'm not sure if I want it to. Heavenwood's brand of metal is dark, gloomy and redundant invoking influences from goth, doom, and death metal. Even contributions from guitar greats like Gus G., may not be able to save 'Redemption' from its inherent monotony. If it weren't for the exceptional guitar solos, I would have been bored to tears.